The annual New Year's Concert from Vienna, seen by millions on TV worldwide, is the best-known classical concert in the world. 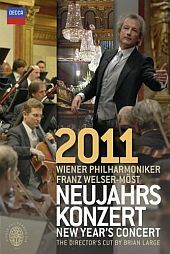 The 2011 concert will be conducted by Austrian-born Franz Welser-Möst - newly installed as the music director of the Vienna State Opera and a favourite with Viennese concertgoers. Presented in the glittering Musikverein, the concert features a charming programme that offers perennial favourites alongside some intriguing Strauss premieres.